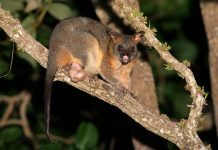 Possums are generally omnivores but they do take on animals that aren’t part of their staple diet. While they prefer to feed on small invertebrates opossums are also known to consume chickens. Medium sized opossums will prey on young chicks as well as eggs but the bigger possums can eat adult chickens. 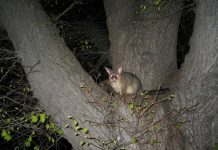 Therefore, if you doubt that your chickens are disappearing each passing day and that there are opossums living near your backyard gardens, then it is most certainly the opossum that actively hunts your chickens and not your pet dog or a cat. Let’s see why do possums eat chickens. Yes, possums definitely eat chickens although chickens do not make up the major portion of their diet. However, opossums are more likely to feed on young chickens and eggs as compared to adult ones. Like raccoons, possums will probably leave remains only a small portion of chicken. This shows that they love to eat chickens just like we humans do. Possums are thought to consume as many as 20 chickens in one night. They will eat just about anything from dead animals to a live prey. Their teeth are strong enough to tear flesh or even bones of the prey. 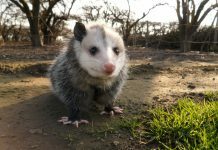 Can you Prevent Opossums from Catching Chickens?…If So, How? Opossums have sharp sense of smell. They are attracted to just about any nearby food even if that food doesn’t really belong to them. For instance, if you leave your dog’s or cat’s food in your backyard garden, you’ll be attracting many uninvited opossums. It is better that you should place a fence around the garden particularly where you keep your chickens. Although opossums have powerful teeth but they are unlikely to cut through the fence. Do not use chicken wires for opossums can easily tear it. Nearly all opossums are nocturnal so they hunt primarily at night. Chickens especially chicks are highly vulnerable at night. Thus, you should place them somewhere inside the wooden house to prevent intruders.